Whether you need incoming goods inspection, fast dimension checking during production, or quality assurance, you want the HEIDENHAIN length gages. The incremental length gages provide a large measuring length whether the part measures 5 mm or 95mm. No matter what application you are running, HEIDENHAIN has the right length gage for the required accuracy. If you need to calibrate your gage block or inspect your measuring device, the HEIDENHAIN incremental length gages provide large measuring ranges and high accuracy. This helps you to simplify the calibration of your measuring devices required to ensure traceability. So you don't have to use as many reference standard blocks. Incremental length gages are also ideal for position measurement on precision linear slides or X-Y tables. Working with measuring microscopes, for example, becomes much easier thanks to the digital readout and the flexible datum setting. Sub-micrometer Heidenhain length gages featuring the small profile Specto (0.001 mm accuracy), the versatile Metro (0.0002 mm accuracy) and the ultimate Certo (0.00003 mm accuracy). For length gage displacement applications ranging from in process, shop floor control to highly controlled metrology labs. 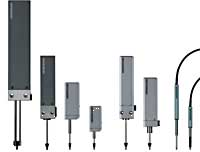 Contact us for more information on our Heidenhain length gages!